Decades of neglect, inequality, and disenfranchisement mean that all Houstonians, but especially the poorest and most vulnerable, have been left utterly undefended. It’s with this in mind that Donald Trump’s pardon, on Friday, of former sheriff Joe Arpaio of Maricopa County, Arizona—even as the Category 4 hurricane known as Harvey was bearing down on the Texas coast—stands as an indelible image of the way our political and climate catastrophes now converge in real time. The unmistakable message, a president explicitly siding with militant white nationalism against the Constitution and the rule of law, coincided with news from Texas that Border Patrol checkpoints would remain in operation despite the storm. This raised the prospect of undocumented persons, fearful of law enforcement, choosing between deportation and drowning. If you want a glimpse of how Trump’s America will handle climate disruption and waves of internal climate refugees, beginning right about now, consider Arpaio’s pardon and all it represents. Much of Houston now stands under feet of water, with the rains still coming, a predicted 50 inches in places before this storm is done. The National Weather Service calls the event “unprecedented,” its impacts “beyond anything experienced”—while climate scientists like Pennsylvania State University’s Michael Mann inform us, as they have for years, that such cataclysmic downpours are to be expected in a warming world. Soon the damage in Houston will begin to be assessed—the lives lost, the property and infrastructure destroyed, the homes, businesses, and livelihoods washed away. But the human catastrophe began long before the storm. Decades of neglect, inequality, and disenfranchisement—to say nothing of heedless development and a lack of flood planning tantamount to criminal negligence—mean that Houstonians of all backgrounds, but especially the poorest and most vulnerable communities, primarily communities of color, have been left utterly undefended. As I’ve reported in this magazine, communities adjacent to the refineries and petrochemical plants on the Houston Ship Channel—the largest refining and petrochemical complex in the country—and along the Texas coast from Corpus Christi to Port Arthur, are exposed not only to deadly air pollutants every day but also to the threat of massive toxic releases as flood waters rage. Houston is the belly of the beast when it comes to both fossil-fuel pollution and Big Oil’s political choke hold, only tightening under Trump. My friend Liana Lopez lives on Houston’s east side and organizes with the local grassroots Texas Environmental Justice Advocacy Services (TEJAS) and the national Climate Justice Alliance. Since the storm hit, TEJAS has reported overpowering chemical odors in the communities near the Ship Channel, coming from the direction of the refineries. Justified fears of a long-anticipated toxic disaster run high. Still, as she told me in an e-mail, “The corporations have been warned for decades by communities and scientists, through legal and bureaucratic means, that this type of flooding event was possible. They not only ignored but fought the requests to upgrade their refineries to address climate impacts.” Now, she points out, “the cost to clean up the chemical spills in the aftermath of Harvey will not be billed to corporations.” The cost will be borne by taxpayers, an unconscionable corporate handout to the polluters themselves. There’s no such thing as adaptation to fifty inches of rain—and if we don’t transform our entire energy system, making fossil fuels obsolete, floods like Harvey brought will come to be seen as unexceptional on a catastrophically warming planet. Nor is it likely those same corporations will be required to prepare for the next record-breaking storm—and the one after that. Under the Obama administration, the federal government began taking the first baby steps toward preparing the nation’s infrastructure for climate change. Earlier this month, Trump blew up the Obama order requiring new infrastructure projects to account for climate impacts such as sea-level rise. 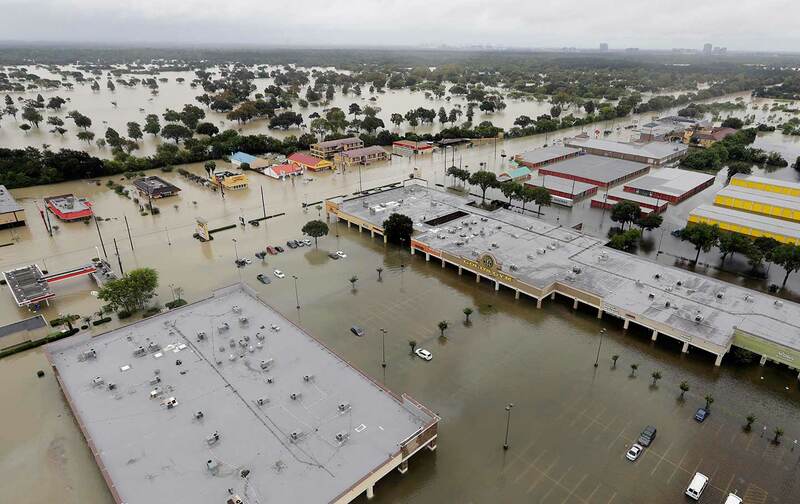 Suffice to say, it is unlikely that Republican-controlled governments in Austin and Washington will impose new climate-resilience regulations on their corporate benefactors. But the truth is, national Democrats have given us little more reason to believe they’re ready and willing to face our climate reality. Because there’s no such thing as adaptation to 50 inches of rain in one storm—and without a society-wide mobilization to transform our entire energy system, making fossil fuels obsolete, floods like Harvey brought will come to be seen as unexceptional on a catastrophically warming planet. In fact, they already are. As Harvey approached Texas, yet another epic flood pummeled South Asia, as a ferocious monsoon put a third of Bangladesh underwater and left more than 1200 people dead across that country, India, and Nepal, with millions homeless. Just as Houston’s catastrophe mustn’t be viewed in isolation, as merely another extreme weather event, it’s time to acknowledge that our climate reality has shifted—and that it’s time for the climate fight to shift with it. I mean the shift from a world in which we struggle to prevent climate catastrophe to the world we live in now, the one where we’re actually forced to live, or struggle to live, through it—the poor and marginalized struggling hardest of all. As the climate emergency converges with our national political emergency, nothing illustrates this shift more clearly, in this country, than Houston. The fights for equality and for democracy, so immediate and pressing in these dark times, are not separate from the fight for climate justice—because we’ll never have the latter without the former.